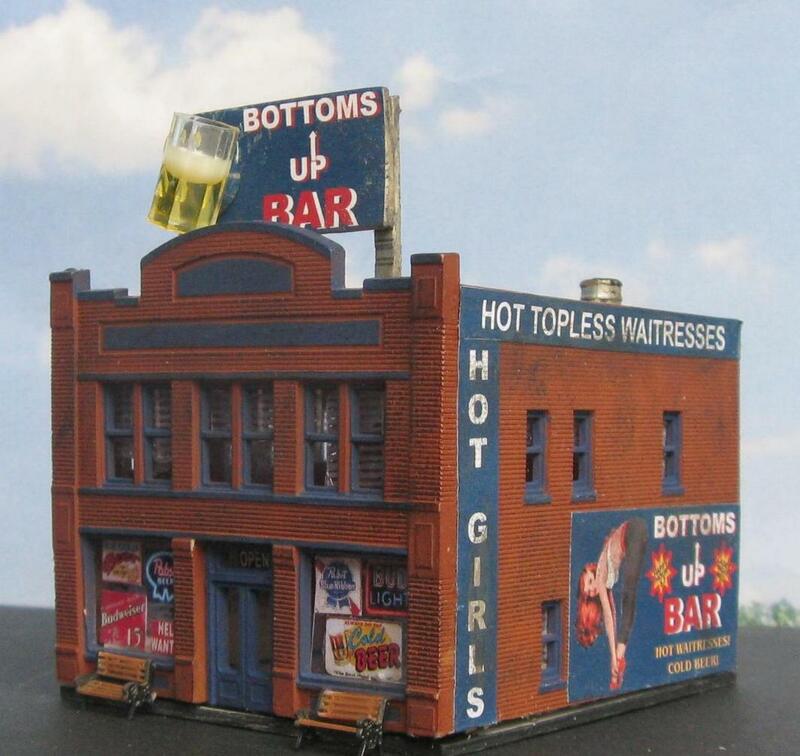 Details: Wooden Roof Billboard Sign with 3-Dimensional Beer Mug, 2 Park Benches, Various Ghost Signs & Advertising Signs, Acrylic Windowpanes, simulated Window Blinds, simulated Tar & Gravel Roof with Smoke Stack. Build: Custom Built, Hand-Painted & Weathered. Size: 3 ¼ inches x 2 ¾ inches and is 3 ¼ inches tall to the top of the billboard sign. 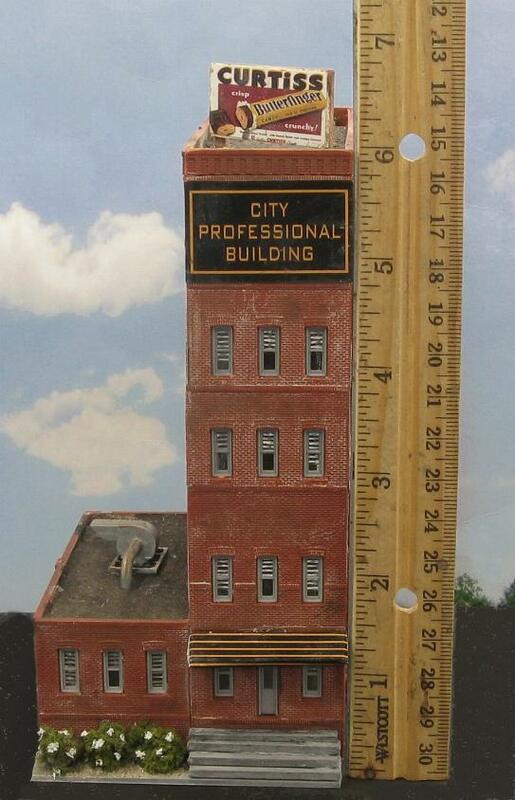 This auction is for an upscale WOODEN BARREL COMPANY with CEDAR SHAKE SHINGLES in N scale. It is a custom built building by artist D.A. Clayton from a MUIR KIT. It measures approximately 3 ½ inches by 3 inches and it 2 ¾ inches tall. 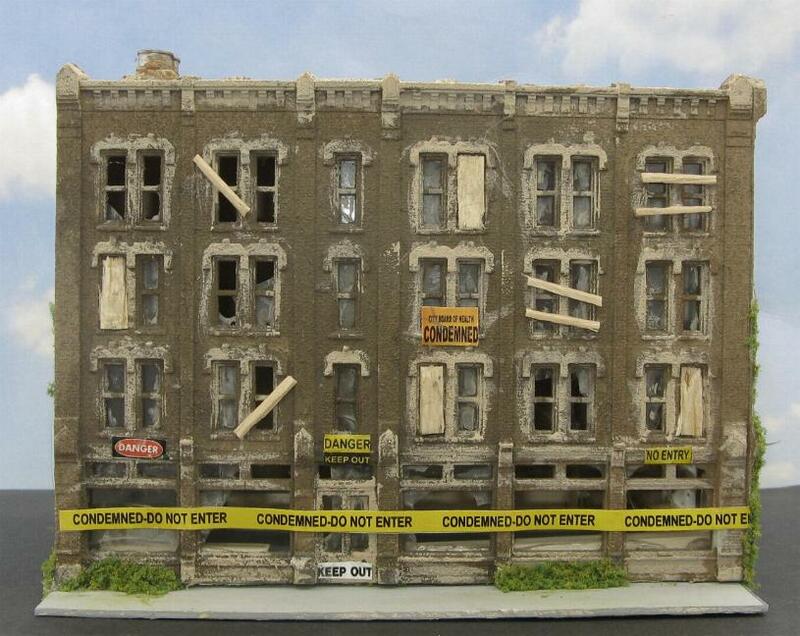 It has been BUILT, WEATHERED, DETAILED and ready to place on your layout. For more PHOTOS, more INFORMATION or to BUY . . . .CLICK HERE! Details: Tar & Gravel Roof and Tar Paper Roof, Wooden Billboard, Preiser Figures, Park Bench, Double Lamp Post, Fruit/Vegetable Crates, Awnings, Ghost Signs, Crates, Acrylic Windowpanes with Venetians Blinds & Shades, etc. Size: 4 inches x 3 ½ inches and is 3 ½ inches tall to the top of the Billboard. Details: 6-Stories almost 7 inches tall with the Billboard, Brick Mortar, Tar & Gravel Roofs, H/VAC, Wooden Billboard, Loading Dock with 2 Doors, Awnings, Bushes, Sidewalk, Ghost Signs, Name Sign, Acrylic Windowpanes with Window Shades, Grass Turf, etc. Size: 4” x 3” x 6 3/4 to the top of the Billboard. Details: Tar & Gravel Roof, Large H/VAC, Roof Vents, Warning Signs & Yellow Caution Tape, Boarded Windows, Broken Windowpanes, Grass Turf, etc. Size: 5 ¼ inches x 3 ¼ inches and is 4 ¼ inches tall to the H/VAC.